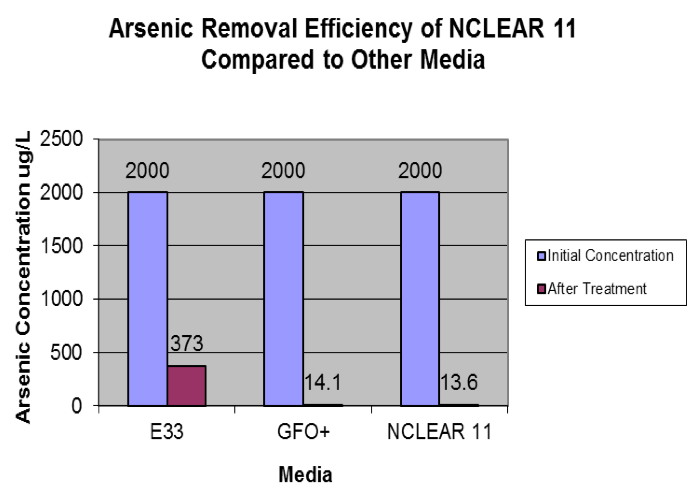 The chart above compares the sorptive efficiencies of Nclear and other commercially available media typically used to remove phosphorus. As the chart illustrates, the isotherms for both forms of Nclear indicate greatly elevated sorptive capacities compared to today’s widely used technologies, such as granulated ferric oxide (GFO) and activated alumina. The isotherm for Nclear 11 depicts our expectation of the variations in P adsorption ratios in a typical lake application, while the Poly isotherm depicts the maximum adsorption ratio we have measured to date (utilizing phosphate process water at Piney Point).